Text and photo: Victor Moreno the up-and-coming artists. Today, Galleri Kleerup is a reference for new artist in Stockholm and most likely in Sweden and Scandinavia. But the gallery also gains steadily its good reputation abroad. We had a chat with Jonas at his brand new space in the heart of Stockholm. How do you see the evolution of the gallery in the lasts years? I think we were struck by the financial crisis, for us this still is quite small-scale gallery. However we managed to establish ourselves as one of the most emerging contemporary art galleries in Stockholm, and Sweden maybe. We managed to get ourselves on the map. I think we are on a top 5 here in Sweden; in fact we were claim as 2nd best gallery last year in the national newspaper. So we gained popularity. This opened us doors to good artists and lots of press. We are down from some more experimental and DYI context to forefront more professional gallery with the artists we represent. We already got more than 10 artists in our roster and more news TBC. How do you translate this maturity in the current scenario of independent art exhibitions? We started to do art fairs, both in Sweden and abroad. We’re been to Miami, New York, Scandinavia and Europe for different fairs. So the gallery has developed a lot in this sense. We received attention from international artists and lots of different projects we are participating in. As I mentioned, financial times are quite bad so that affects us in the gallery business quite a lot. It’s been quite struggle to manage to keep it up in the last 4 years. You know, a lot of galleries shutting down. But we managed to kind of hanging there. Do you think the gallery has covered that gap you were talking about in your start-off? Well, I hope I’ve been able to develop the gallery in that way. When I talk to people they see me as an instigator of pursuing my own generation, I’m 38 now, to start buying art. We I started all the potential buyers were in their 50 or 60 so I though something has to change. So that’s why I tried with this gallery create some kind of persona of myself. That’s why I call the gallery my own name, like some many people do. So basically people know me as a person and know for what I stand for. I try to represent in all types of aspects, what I think is interesting in good art. We’ve built a very strong profile. Could you name some project you are been lately involved, to have an example of the type of things you do now? We are doing a new exhibition for `Birds´ and a group photo exhibition with different artist from Brooklyn, curated by William Dunleavy. Just as long as I feel it is right for me, I want to do it in some way. I don’t look too much to other galleries, I feel we are taken a separate path a apart in our own way with this gallery. It has kind of create it itself, there is a few young galleries very strong but I feel like we all have different positions in a way. I’m not from the art college at all and I don’t have any background in the gallery industry or art industry here in Stockholm, at all. So I had carte blanche in that way. Do you think that is positive in all ways? From the start it was difficult to try to get the artist to work with you, but now we are one of the most established galleries, so now people see us as very potential gallery. Your roster has necessarily only Scandinavian artists? I think we have now 11 artists – if I’m not missing anyone – and I maybe 6 of them are Scandinavian-based, in Sweden and Denmark. Within Scandinavia if artist has a gallerist in Finland or Denmark or Norway, they normally don’t need another gallerist within Scandinavia. 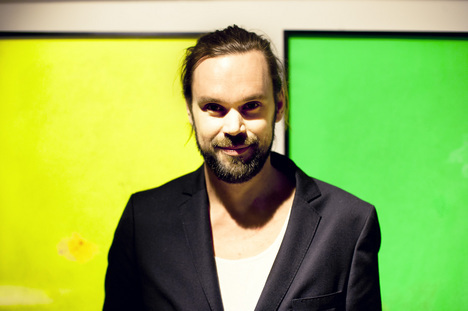 But we have exhibited some artist, like Kim Hiorthøy, he has one of the most attractive galleries in Oslo and he’s well known in New York, so we exhibited him, but we don’t represent him. So we show his work but the art belongs to his gallery in Oslo. But with the other artists, for example they are based in the U.S, we have 100% representation in Europe. It is the case of Noah Lyon and Yoshi Sodeoka. We also have Li Shurui & He Wei, Chinese artists that we are showing now. That’s no representation but we represent their work for a year. We may take it to some other fairs outside Stockholm. Representing is like a management: e-mails and calls, tactics and you help them to get other shows, you know. Makode Linde and Christian Saldert are in Berlin (but they are Swedish) and Henrik Vibskov and Andreas Emenius in Copenhagen. Which European fair would you like to point out? We were a few months ago at Art Copenhagen. That was good; I think they are redoing it now, so it is going to be a bit different from now. Nevertheless Art Basel is the main one, in Switzerland. Then there is a lot of good satellite fairs. Then, Frieze in London is probably the biggest one. Then a new one there called Art 13. Have you been involved with them? Yeah we were in contact. It is a lot of money to participate in fairs. This year we say no to a lot of fairs. We had calls from Barcelona as well, but it was at the same time we had this in Sweden. What could you point out in America? We went to Miami, part of Basel and we were at one of the satellite fairs called Pulse. They also have New York, so we were there at the fair. I think is one of the most attractive satellite fairs around Basel. We showed Lucky Thief. It is a very expensive P.R thing; you have to make a lot of sales. You can have your booth and show one or different artists, for sure. Also it cost a lot to ship stuff, expensive if you had sculptures, so it is a big risk. We sold many sculptures but we had a few big ones, really heavy ones, which didn’t sell, so their still in New York, so we needed someone to take care of them (laughs). Could you be so kind to let me know a few tips about Stockholm? – Konst-ig is the best place in town for art books. – Papercut is where you find all art and fashion magazine. – Bonniers Konsthall. A lot of art foundations has popped up last couple of years. Bonnier is still the best and the most contemporary and cutting edge. – Atelier. Best place for lunch, have a look at the exhibitions as well at Konstakademien (Fredsgatan 12). – Djurgårdsfärjan. A very contemplative and beautiful ride between Slussen and Djurgården. Especially in wintertime when it’s less crowded. – Vassa Eggen Steakhouse. Still the best restaurant if you’re into great meat. Also, great art piece by artist Christian Saldert (that’s represented by the gallery). – Riche. It never goes out of style. That’s where I have my drinks, any day a week. – Rönnells Antikvariat. Superb second-hand bookshop for art and fashion books. – Östermalmshallen. Take a friday afternoon and watch the posh upperclass pick up their high quality fresh fish, cheese and vegetables in this 19th century masterpiece. Lots of great places to eat as well. – Raoul Wallenbergs Torg. Best piece of contemporary art in an urban setting according to me. Start your stroll there, walk along Strandvägen to… Nobelgatan, Djurgården. Lots of beautiful embassies from early 20th century. – Sturehof. Always open, everyday of the year.